Ok so you’re on the hunt out for the best tool box and it has to meet your needs. Tool boxes can be all kinds of sizes, but for this write up we will try to address what we believe to be the best in each of 3 categories we have chosen. We’ve chosen categories that make the most sense for most people. What makes a good small sized tool box then? We reviewed the current overall market and picked out 3 contenders for this category. It’s a personal taste decision ultimately. Price wise, most of these kinds of portable tool boxes are typically under the £50 mark. The Stanley Fatmax – a waterproof toolbox that has one of the sexiest names on the planet. 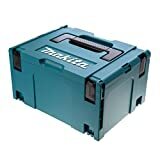 The Makita 821551 – handy to know, it is part of a small family of storage boxes that can all be latched together when stored. The Stanley STA194858 – a tough toolbox with metal locking clamps. It also has top sections suitable for small items like screws etc. Our winner for best small tool box is a joint effort, and not surprisingly it’s both of the Stanley toolboxes. * The second is ideal yet tough for most normal tools. * You get a 1 year warranty as standard, and if you register within 4 weeks you can extend it free up to 3 years! The Stanley Fatmax is perfect for all your larger tools. Pop the bigger tools and and you’re good to go. * The half sized tote tray inside is good for a few small bits. 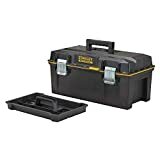 * This tool box is not ideal for storing lots of smaller tools as it will get messy. The Stanley STA194858 then fills the gap for the perfect tool box for your smaller items. * It’s a more compact size, yet tough, with metal latches and has waterproof capabilities. We wanted to look at and identify possible leaders in this area. Obviously on wheels, and must be easy to pull, move and offer good solid drawer action as well when fully loaded. Lockable drawers is also a must have feature. Price wise, we found that most of these kinds of tool chest are typically under £300, some even under £100. For this money you get what you expect. A tool chest on wheels that does what it’s supposed to and does it fine. (If you really need the best you’ll have to look at the next category for the premium tool chests under £1000 as they are the “no holds barred” models). * We were on the look out for as many features as possible, but all while retaining solid build quaility. * We then identified these 3 and made our purchase. * We filled each drawer and performed a series of opening and closing tests. * We then looked at their overall appearance and the wheels. 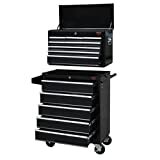 Dirty Pro Tools extra large tool chest with roll cabA strong tool chest with 14 drawers helped by US ball bearings that won’t stick when loaded. We have featured Dirty pro tools before (on our cement mixer page) and they are doing good things with tools. NOTES: It has two castor wheels that freely spin and two that are fixed. In an ideal world all 4 castors would freely spin but this isn’t a deal breaker to be honest. Good for a domestic use for most of your tools, but if you are hoping to use this professionally don’t expect to get a full set of pneumatic tools in it. Features 5 deep powder coated drawers with a smooth ball bearing movement that won’t stick when fully loaded (here is their 7 drawer model instead). Each drawer has an anti slip foam layer inside and can be locked. A thick bar helps you to easily move the tool chest around your garage or home workshop. NOTES: The overall dimensions do NOT include the handles. Handles and castors will need asembling when you receive your tool chest. You coould leave the handles off if you were putting these drawers under a worktop for example. 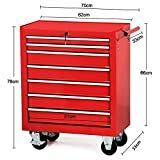 Here is a tough tool chest that features 7 drawers (5 large and 2 small), that are lockable, and there are two lockable wheels to help it stay fixed when at your side. NOTES: In terms of a rolling tool chest this pretty much is the one to go for. It’s taller than the 5 drawer one above and has 2 locking wheels. It’s also the accepted “Red” colour. Our winner for best tool chest on wheels is the Popamazing 7 drawer tool chest. The Popamazing tool chest gets our top rated recommendation for this category because. The Popamazing brand have consistently good real life consumer reviews across all their Amazon departments. The build quality is very good. The Popamazing 7 drawer tool chest is perfect for your workshop storage needs. (if money is no object you can review higher priced tool chests here). In this category the tool chests have to be far superior. * We then made an overall decision to find the best 3. DJM Direct multi drawer combination unitsHere we have the brilliantly affordable totally versatile setup from DJM Direct. You can choose a number of different combinations of units. This combination is the 9 drawer small top section, plus the 3 drawer bigger mid section and the 7 drawer larger lower section. Put them all together for a great set up! You can mix and match different configurations too. Tough metal construction with hi-gloss triple baked enamel finish. NOTES: There are no drawer liners with these tool boxes however you can buy your own liners and cut them to size. This is also not 100% “professional” as it is made using thin metal, but we included it because it is very low cost and offers great value for money for a lightweight unit. Through and through this is a very high quality tool chest as used by race teams and professional garages. The two parts can be split if desired. The drawers feature a “soft” shut lock mechanism so no trapped fingers. Lock all drawers with a single turn of the key. NOTES: The heavy nature of this product means it will be delivered on a pallet. 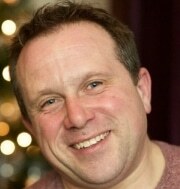 You will need to be able to move it yourself into position and will need to be available to accept delivery. 21 drawers and a top section allow you to organize all your tools very efficiently. Heavy duty side handles. Tool drawer labeling. Internal security key locking system for extra security. Our winner for best tool chest under £1000 is the Motamec Pro94 heavy duty tool chest. 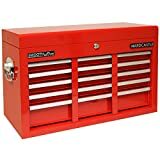 The Motamec tool chest gets our top rated recommendation for this category because. The build quality is exceptionallly good. You can see this will last a very long time. 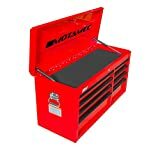 The Motamec Pro94 tool chest is our highest rated tool chest under £1000. First up, ask yourself “will it fit”? Look at your biggest tool you want to put in the tool box or chest and look at the tool box size. See if it will fit. Do you need to move it around? If so then be sure to get wheels. Locking wheels are a useful addition. Are locks a MUST HAVE ? For spanners and sockets a lightweight model will be easier to move around. For anything heavier then a heavy duty chest will be needed. Prioritise your “most used” tools. There’s little point putting a tool in the box that only gets used once a year. The best tool box for you might not be the same for others. You need to look at your own personal needs and what tools will be used the most. The majority of boxes and chests on this write up are actually inexpensive. Even the high end premium units can be classed as affordable (especially when you look further afield at units that cost £4000 and upwards). Each unit on this page was very carefully selected for it’s strengths over competing products.